Oz Rey will also curate food halls for North American Properties at Revel in Gwinnett County and Riverton in the New York metro area. Oz Rey LLC has been contracted by North American Properties (NAP) to curate Main & Main in Colony Square, the Atlanta Business Chronicle Friday first reported (paywall). The food hall operator out of Texas will also work with NAP on food halls in at least two additional developments. "After researching and exploring the country’s top 20 food halls, [NAP] has selected award-winning te, Oz Rey, to develop a series of next-gen dining destinations at three mixed-use communities: Colony Square in Midtown Atlanta, Revel in Gwinnett County, Georgia and Riverton in the New York metro area," according to a press release Friday. Oz Rey is taking the reigns from Charleston-based Indigo Road Hospitality Group, the company behind Colleta, Donetto, Oak Steakhouse, O-KU Sushi, and Tiny Lou's in Atlanta. Indigo Road's Steve Palmer was to oversee the project per an announcement late-2017. Oz Rey will now develop and manage the 25,000-square-foot food hall. The company is behind Houston's Fin Hall. Vendors have not yet been announced, but Oz Rey has been charged with securing 15 to 18 food stalls and two bars for the Midtown project. “We understand firsthand the challenges that come with the restaurant business, which is why we are diverging from the traditional model,” David Goronkin, president of Oz Rey, said in the release. Main & Main is slated to deliver in 2020. 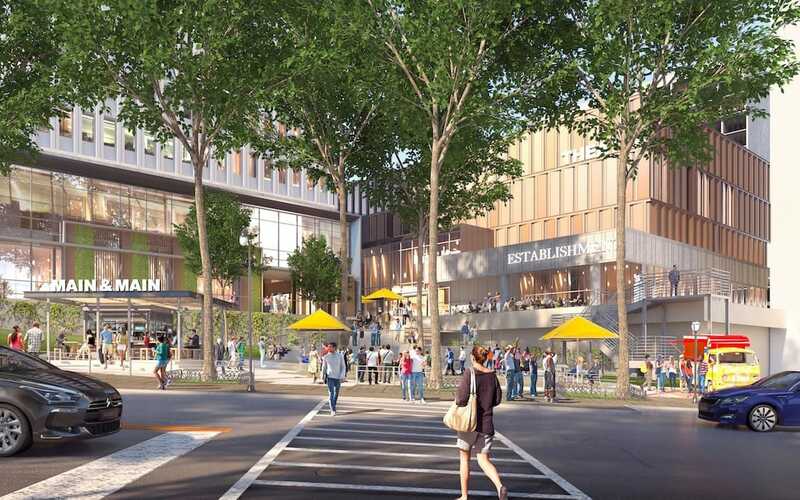 In addition to Colony Square, Oz Rey is working with NAP on a 25,000-square-foot food hall at Revel, a $900 million, 118-acre mixed-use and entertainment destination anchored by Gwinnett County’s Infinite Energy Center. Revel’s food hall is projected to open in 2021 and will serve the 1.2 million guests who currently visit the performance venue annually along with guests of the new mixed-use community. Oz Rey and NAP are also collaborating to bring a 25,000-square-foot food hall to anchor the 400-plus acre, waterfront mixed-use community Riverton in the New York/New Jersey Metroplex. Riverton’s food hall is expected to open in 2021.